Read about 'Proceed With Caution' the second episode of Beauty And The Beast. Okay, episode 3 shows more about the growing relationship between Vincent and Catherine. 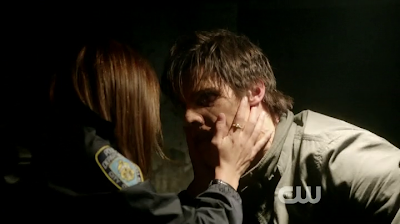 I like that she drags him into helping her on one of her cases and that she helps him remember who he was. The way she calms him down when he’s in beast-mode, it really is very sweet. They even have couple-like fights and conversations. They obviously care a lot about each other. And although they’re not actually together, together, or officially, they sure do act like it. Also, JT gets the funniest lines and dialogue. He is fast becoming my favourite character in the series! between Grey Anatomy's Owen Hunt and Cristina Yang. JT: Do you not have a job? What are you doing here? JT: Yeah, no Twitter either. You know why? He can’t have any followers. Everyone needs to believe he’s dead or he will be, for real. JT: What? He hasn’t called? You know they say that if you haven’t heard from him in 3 days, he’s just not that into you, I’d move on. Catherine: That is why I’m here. You’re not the only one who worries about him okay. I hadn’t heard from him, I just wanna to make sure that he’s okay. Catherine: Can you just give this to him? JT: So you and Catherine have decided to keep in touch. 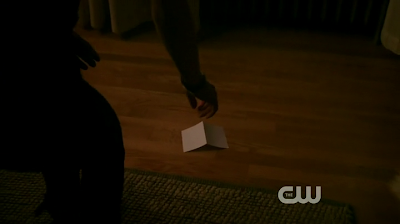 JT: So now I’m a carrier pigeon passing notes like I’m back in high school. What? JT: She’s here? So carefully means not careful at all. Catherine: I got your note. JT: What note? You already wrote her back? There's something sweet, romantic and "old school" about writing notes. Catherine: You know I think I’ve had unrealistic expectations that you can communicate or be in the outside world. Vincent: I wish I was Batman too. Catherine: No I just wish you were a normal guy. Catherine: That was not what I meant. Vincent: Without all the baggage. Catherine: Okay what I am trying to say badly is that I get it. In order to be in contact with you it has to be on your terms. It’s just hard. But I’d like to make it work. Vincent: Then maybe we need to revise the terms, just in case. Catherine: You wanna help again. Okay here’s one. We can’t go by without one of us reaching out to say ‘I’m still alive’. Vincent: Fine. But my place, you can’t go there, unless it is a dire emergency. Catherine: How am I supposed to know what qualifies as a dire emergency? Vincent: You call me and you ask. Don’t get too excited. It’s only good for 3 more days. Vincent: Then we play that one by ear.